Volunteers are sought by the Department of Gastroenterology, Monash University for a dietary study and research study entailing respectively the consumption of a diet low or high in natural salicylates for 4 weeks (all meals provided), and a diagnostic salicylate test. Salicylates are chemicals that occur naturally in many plants to protect the plants against insects and diseases. 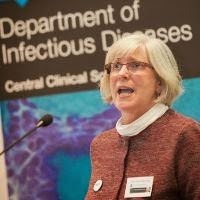 Professor Jennifer Hoy has 30 years' experience in HIV clinical research and patient care, particularly on the effect of HIV and its treatment with antiretroviral therapy on different body systems which contribute to the increased likelihood of chronic illness such as cardiovascular disease and osteoporosis. Prof Hoy gave a public lecture on the transformation in the lives of people with HIV, how her current research is changing the way doctors help people with HIV, and outlining the challenges ahead. The lecture was an independent affiliated event with the international AIDS 2014 conference hosted in Melbourne 20-24 July. Improved trauma systems are a part of the solution to the global injury epidemic and have been very successful in Victoria. Can they work to reduce the 5 million trauma deaths elsewhere in the world? India is tackling an injury problem of epidemic proportions. The Australia-India Trauma Systems Collaboration (AITSC) is a collaboration of clinicians and researchers, academic partners, and governments. It aims to develop and test some innovative pre-hospital, hospital, and post-hospital interventions that could improve care of the injured in India and Australia. A 2012 Monash Strategic Grant Scheme project has resulted in the publication of a series of eight guideline papers on Cognitive Rehabilitation following Traumatic Brain Injury. The project was led by Dr Peter Bragge from the National Trauma Research Institute (NTRI) and Professor Jennie Ponsford, Director of the Monash-Epworth Rehabilitation Research Centre, in collaboration with Dr Mark Bayley from the Toronto Rehabilitation Institute, Canada. The Monash University Department of Gastroenterology is researching the impact of a high prebiotic diet. This diet is designed to establish a healthy balance of gut bacteria, needed for optimal health. While the diet is essentially a high fibre diet, it emphasises the consumption of foods that are high in prebiotic fibres. Prebiotics are fibre compounds that pass through the stomach and small intestine undigested. When prebiotics arrive in the large intestine, they promote the growth and activity of resident beneficial (probiotic) bacteria. Having a healthy balance of gut bacteria may benefit digestion, the absorption of minerals and immune system function. Patients who are discharged from intensive care units (ICUs) after-hours have a higher chance of death than those discharged during the day, a new study has found. Findings published today in Intensive Care Medicine, show that one in seven ICU patients continue to be discharged to general wards after-hours, and this has not changed for the past eight years. Lead researcher Dr Dashiell Gantner, from the Monash University Faculty of Medicine, Nursing and Health Science, said it remains unclear why practices have not changed. Dr Gantner is an Intensive Care Fellow at the Alfred. See 18/08/2014 Monash story.